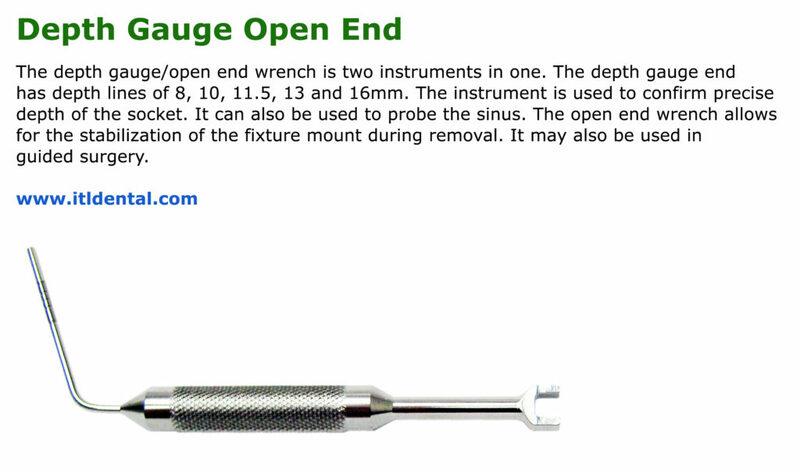 The 6.5mm length shaft allows easier access to the posterior region for screw tightening. Short length latch style drivers are now available for the .050 hex, 2.5mm hex, 3.0mm hex, NobelBiocare, and ITI/Straumann. ITL Dental has introduced a line of HA coated wide pitch threaded implants in addition to the SBM surface treated wide pitch threaded implants and the narrow pitch threaded implants with the standard fixture mount or cervical contoured fixture mount. The HA wide pitch implants have the cervical contoured fixture mount and are available in diameters 3.2, 3.7, 4.2, 4.7 and 5.2mm with 8, 10, 11.5, 13 and 16mm lengths. The line of surgical drills has been expanded to include a 1.8mm Lindemann drill or 1.8mm twist drill as the pilot drill. The 2.3mm to 5.4mm drills have been redesigned so that the hub area of the drill is the same on all drills and accepts a push on drill stopper. 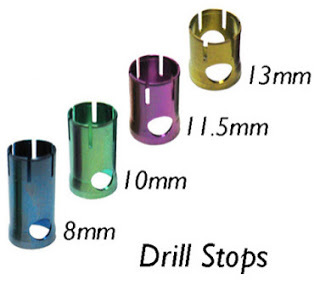 Only 4 drill stopper sizes are needed that will fit all surgical drills. 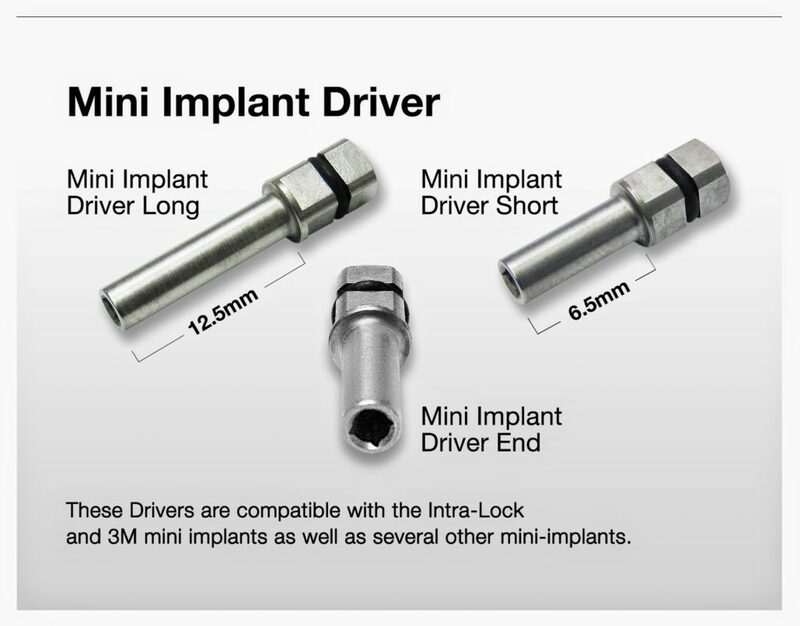 The drills can be reviewed on page 9 of the Implant Catalog, www.itldental.com. ITL Dental is an OEM vendor of dental implants and dental implant accessories. 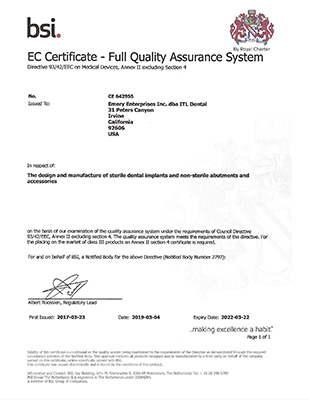 The Company has supplied dental implants and dental implant products to a number of leading implant system companies on a worldwide basis since 1991. Products are manufactured under a quality management system that complies with the requirements of ISO 13485, has a FDA 510K and most recent CE Certification. The WP (Wide Pitch Thread) internal hex implant comes in 5 diameters: 3.2, 3.7, 4.2, 4.7 and 5.2mm, and 5 lengths: 8, 10, 11.5, 13 and 16mm. The 3.2, 3.7 and 4.2mm diameters have a 3.5 platform. The 4.7 and 5.2mm diameters have a 4.5mm platform. The WP implant has the same taper and dimensions as the NP thread implant. The connection is compatible with several other internal hex systems. The internal hex is anodized to match the fixture mount for easy platform size recognition. The surface is SBM treated. The WP implant has the same pricing as the NP implant. A seller by the name of 2014-Gant is selling on EBay a Bone Expander Kit using the marketing materials from ITL Dental. We want to alert any potential buyer that this product is not manufactured by ITL Dental and that the marketing materials being used by 2014-Gant is without permission. If you scroll down their listing, you can identify that the product is not from ITL Dental (note the manual knob which is completely different). The box is also not from ITL Dental as we have a blue anodized tray in our box. In their product description they state that the product is made from French stainless steel. We only use stainless steel made in the US. This seller is attempting to relate its product to the Bone Expander Kit from ITL Dental. It is violating the copyrights of ITL Dental. We want you to know that this product is not from ITL Dental. ITL Dental supplies a single setting torque wrench with a break away head and an adjustable torque wrench with a ratchet mechanism. Each torque wrench has its own lubrication recommendations. The single setting torque wrench should be lubricated prior to each autoclave. The head of the wrench should be positioned in the break-away position prior to autoclaving. A drop of lubricating oil should be placed into the slot where the head breaks away. After autoclaving, the head should be repositioned into its use position. The adjustable torque wrench does not need lubrication prior to each autoclaving. However, lubricating oil should be placed on the wrench head and around the blue dial edge periodically. For normal use, monthly should be sufficient. For heavy use, do more frequently. 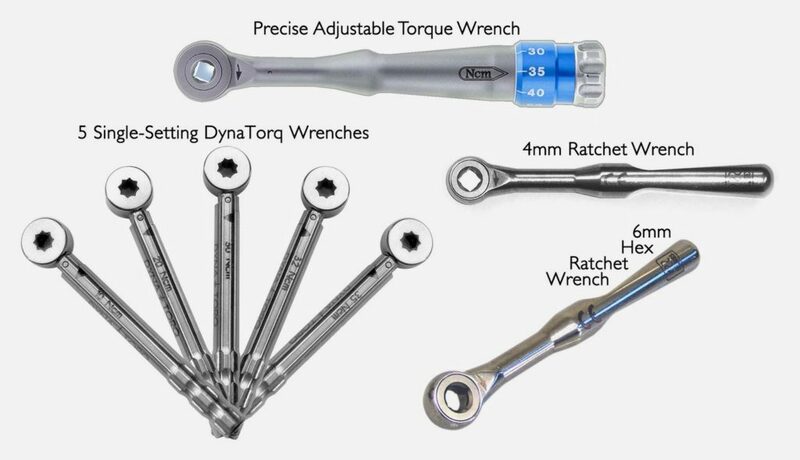 Torque wrenches are stainless steel instruments. Leaving them in a sterilization pouch after autoclaving can cause corrosion.